DYNASTONE® LTD DEVELOPS SOLUTIONS THAT GIVE CEMENT PRODUCTS GREATER BENEFITS, SUCH AS GREATER STRENGTHS, DURABILITY, & ACID RESISTANCE. Dynastone® is a corrosion resistant cementitious material that is able to resist attack from sulfuric acid generated in the sanitary sewer environment. 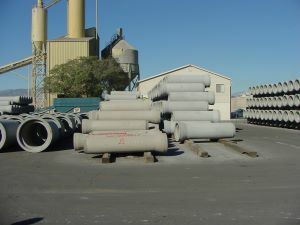 Dynastone® utilizes a chemically activated high volume fly ash mixture that dramatically improves the durability of the concrete pipe. The fly ash is an integral part of the Dynastone® technology. It acts as a replacement of a major component of the Portland cement commonly used in pre-cast concrete pipe. Dynastone® offers several advantages over current solutions to the corrosion problem. Dynastone® is much more economical than lining and more economical than coatings. The entire structure is made of an acid resistant, strong material and therefore there is no risk that an inferior quality application of a liner negating the acid resistance of the rest of the structure. Dynastone® is available in both dry cast and wet cast formulations that can be manufactured with any existing equipment in any size. Aside from the requirement of an ash silo, there are no special installation requirements and welding of the joints is not necessary.